Artillery: Reenactor Mounted, Horse & Naval! Our Artillery, as with other images, can come ready to outfit or with some/all of what they need. This can include: wardrobe, props, weapons, camp, horse and tack as required. Images include Artillery Officers, NCO's and Enlisted, for both American Civil War Union and Confederate, as well as Indian Wars, Mexican War U.S. and Spanish-American War images. AzRAHist's Reenactor Artillerymen are experienced in both horse and mounted artillery. Because of our experience, our gun crews have been selected to be featured as foreground gun crews and also for scenes that required a high level of skill and training. We were the Number 1 gun crew on the CSS Virginia (formerly the USS Merrimac) and the USS Cumberland for the movie Ironclads (TNT) and our artillery advisor was the gunner for a rapid fire sequence filmed during North and South, Book II. 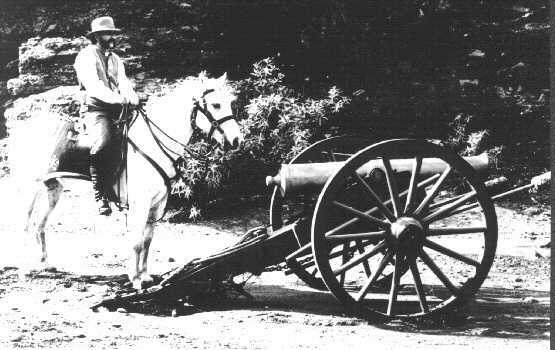 For horse drawn artillery, we have professional horsemen experienced as both wheel horse and lead horse drivers. To me there is nothing more exciting than an artillery piece pulled behind 6 horses. Our reenactor artillery crews have been seen as both US and CS artillery in historical films, such as: Glory; Ironclads (TNT); North and South, Book II; Geronimo, an Arizona Legacy; as well as on the television series Young Riders. We also had a horse drawn (6 pdr) artillery piece in the Fiesta Bowl Parade for several years and one year we had 2 horse drawn artillery pieces (a 6 pdr and 3" ordnance rifle). Additional Artillery images - Click Here.